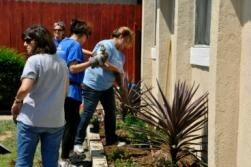 Agromin partnered with Boeing on Saturday, July 26, and donated 6 cubic yards of premium ESG2 mulch to complete a large renovation of one of the homeless women's and children's residences in Huntington Beach. Collette's Children's Home is a non-profit organization that has provided emergency transitional and permanent housing to homeless single women and homeless women with children for 15 years. Since 1998, Collette's has provided these services to more than 2, 500 women and children. 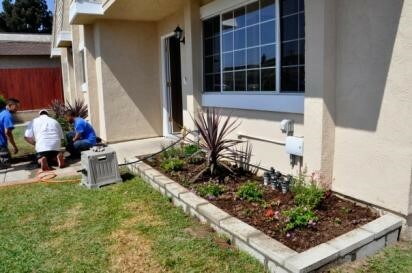 The renovation project included new fencing and the building of garden areas. Agromin provided the mulch to blend with the existing dirt for the new garden area, as well as top off the planter boxes where the new fence was built. 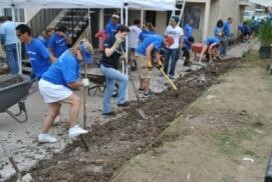 Boeing does an annual "Month of Volunteering" and the group (over 100 of whom showed up with shovels in hand on Saturday) picked a very deserving organization to help! For more information about Collette’s Children’s Home, go to http://healinghomelessness.org/index.html.